If you read regularly, you will see that I have a pretty solid signature food piece in the simple-but-scrummy Meatball. Check the post here for the basic meatball recipe that I used to create this delicious, easy stew. The only thing I added to the basic meatball recipe was about 1tsp of Lemon Zest. 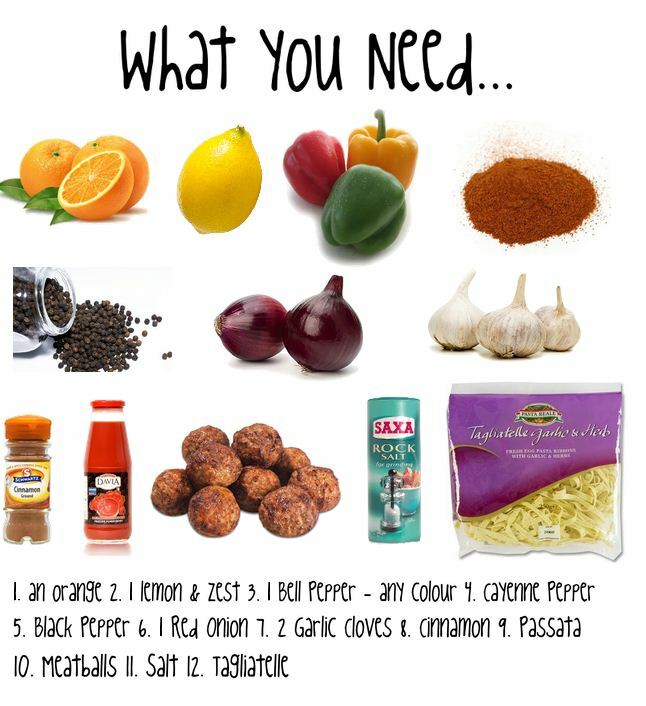 There is actually not that much to stock up on here, you can pretty much throw together a Moroccan stew with the stuff in your cupboard. If you don’t have Cayenne pepper, you can leave it out – it won’t change the taste, it’ll just be less spicy. Step 4: Stir in the Passata and juice from 1 orange and 1 lemon, simmer for around 10mins, stirring in 2tsp Cinnamon, Salt and Pepper. Step 5: Transfer into Oven Dish and add roughly chopped bell pepper to top. Step 6: Cook for 20mins at 180°C. Add chicken stock if the sauce becomes too thick. Serve with Tagliatelle. Or anything.